A biographical musical drama about rock legend Freddie Mercury, Bohemian Rhapsody capably salutes the man without reaching any profound heights. The film starts in 1985 with Mercury making his way alone to the Wembley stage to perform in the global Live Aid charity concert. His story then unfolds in flashback. 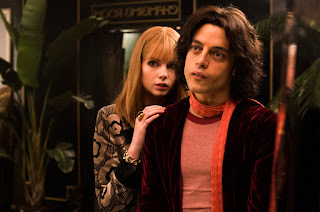 In London of the early 1970s, bucktoothed Farrokh "Freddie" Bulsara (Rami Malek) is a young immigrant and aspiring songwriter working as an airport baggage handler. His conservative family escaped from Zanzibar, and his father does not approve of Freddie's lack of interest in formal education. Instead he joins the fledgling college band of guitarist Brian May (Gwilym Lee) and drummer Roger Taylor (Ben Hardy) as their vocalist. Bassist John Deacon (Joseph Mazzello) completes the foursome, who adopt the band name Queen. Freddie also meets and falls in love with Mary Austin (Lucy Boynton), who inspires his songwriting, and formally changes his name to Freddie Mercury. He is a natural leader, creative force and showman with a terrific voice and flamboyant stage presence. Queen sell their van to record their first album, are picked up by a record label, and are soon extensively touring, growing into one of the biggest rock bands in the world. Life on tour awakens Freddie to his true sexuality as a gay man, and soon his life of excess strains his relationship with Mary and the band's dynamics. A troubled production mostly directed by Bryan Singer with an uncredited assist from Dexter Fletcher, Bohemian Rhapsody overcomes most of its gestational difficulties to deliver on its objective. This is a respectful biography of a preposterous talent, immortalizing Mercury's mercurial and larger than life personality. The film is focused more on the man than the band, and probably rightfully so. May and Taylor are among Bohemian Rhapsody's executive producers, and talented as they are, they probably know more than anyone that Mercury made Queen. The story of the extraordinarily talented outsider rejected by his father and who has trouble filling the void in his life is not unfamiliar, but Rami Malek gives a soulful interpretation of Mercury's prodigious flair, alternating between embracing and battling his demons. After a jaunty opening in which everything clicks in place and stardom is achieved with dizzying speed, the middle act does drag. Mercury falls under the influence of his lover Paul Prenter (Allen Leech) and descends into the crazy and decadent rock star life. Here May, Taylor and Deacon come across as suffering saints, marginally straining credibility. The Live Aid show is used as a framing device. While Queen's stirring performance in front of a world wide audience contributed to the mammoth success of the charity drive and augmented their legendary status, in recreating the show Bohemian Rhapsody spends time as a concert film. The better moments capture the creative process emerging from tensions within the band. 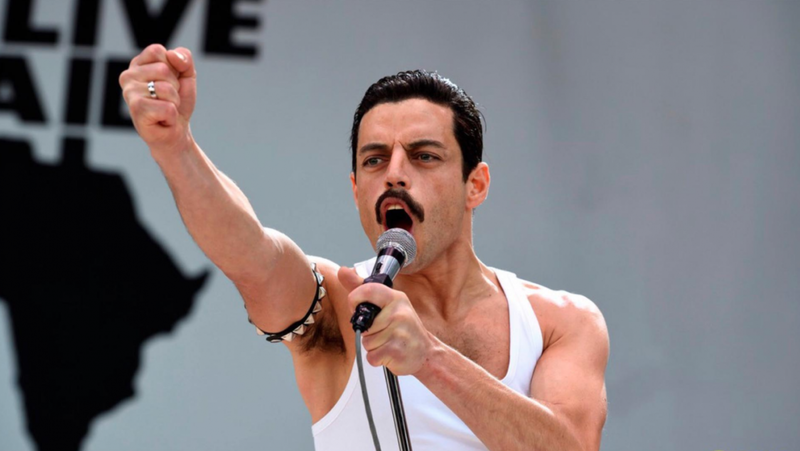 The film recreates the foursome in the studio coming up with classics like Bohemian Rhapsody, We Will Rock You and Another One Bites The Dust, highlighting Mercury's creativity and stubborn unwillingness to settle for formula. Freddie Mercury's music will always live on, and while as a film Bohemian Rhapsody does not match his genius, it does help immortalize it.